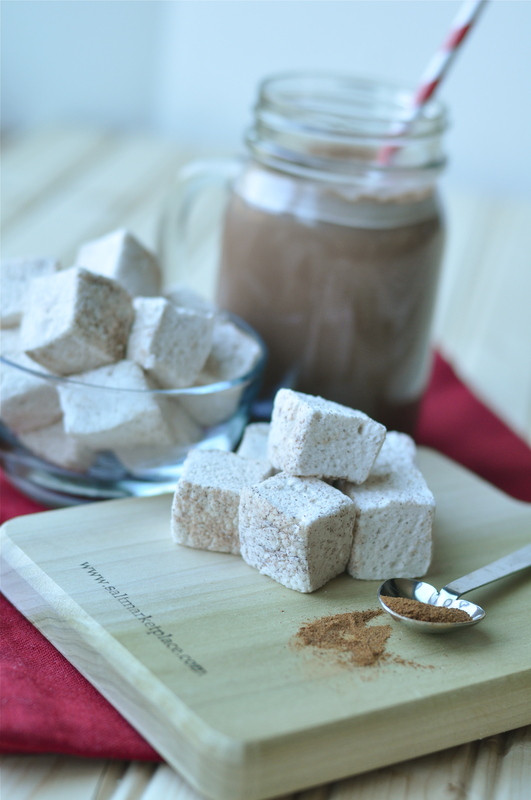 I love the taste of homemade marshmallows. 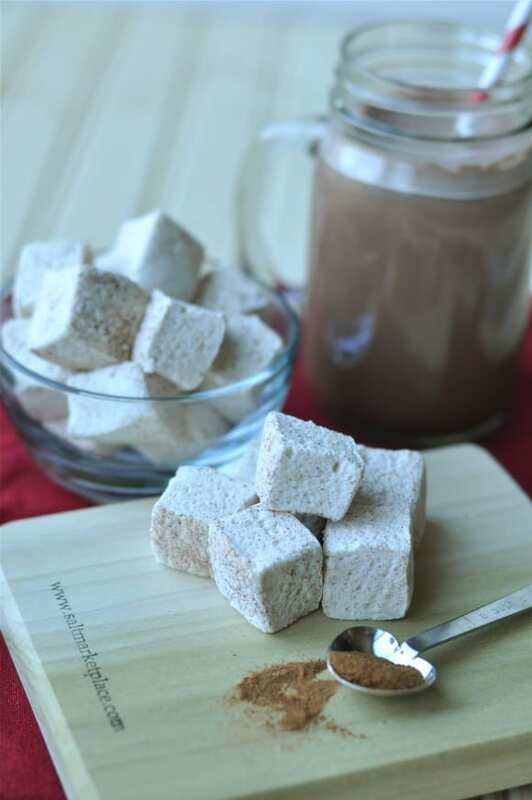 That's why I'm delighted to share this recipe for homemade chocolate and cinnamon marshmallows that Mindy Cone from Creative Juice developed just for us! 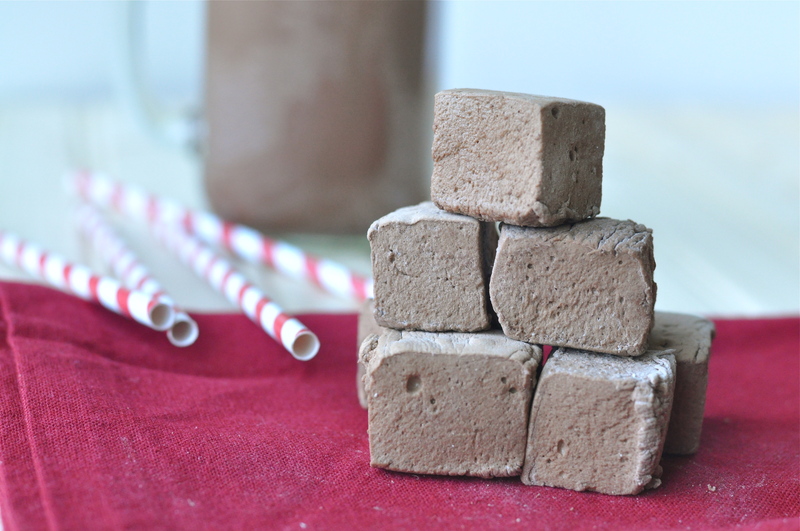 These are perfect light and airy pillows of deliciousness that would be perfect in your hot cocoa or just in your mouth. Place the gelatin and a half cup of water into your stand mixer bowl and set aside for 5 minutes to allow the gealatin to bloom. In a small saucepan bring a half cup of water, corn syrup, and sugar to a boil until the mixutre reaches the soft ball stage (240 degrees using a candy thermometer). Use your whisk attachment and begin whisking the water and gelatin on low speed while slowly pouring in the hot candy mixture. Once you have poured it all in, turn your mixture up to medium high. While that is whisking, melt 4 oz of chocolate and combine it with the cocoa powder. Add the chocolate and continue to whisk until until the mixture thickens and is warm to the touch. 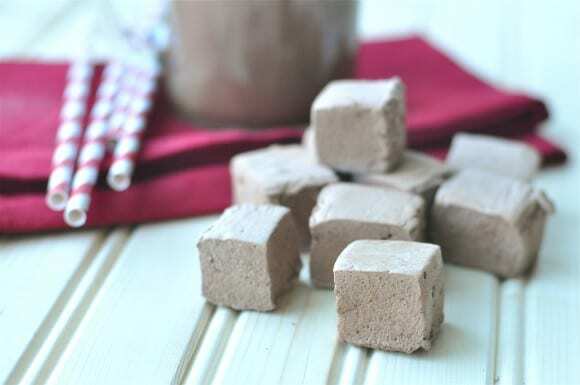 Combine the cornstarch and powderd sugar (or cocoa powder) in a small bowl. Grease a 9x13 pan and dust with this powder mixture to coat. Reserve any remaining mixture for later. Pour the chocolate marshmallow filling into the 9x13 and spread it evenly in the pan. Dust the top with the powder mixture. Leave uncovered at room temperature for 4-6 hours. 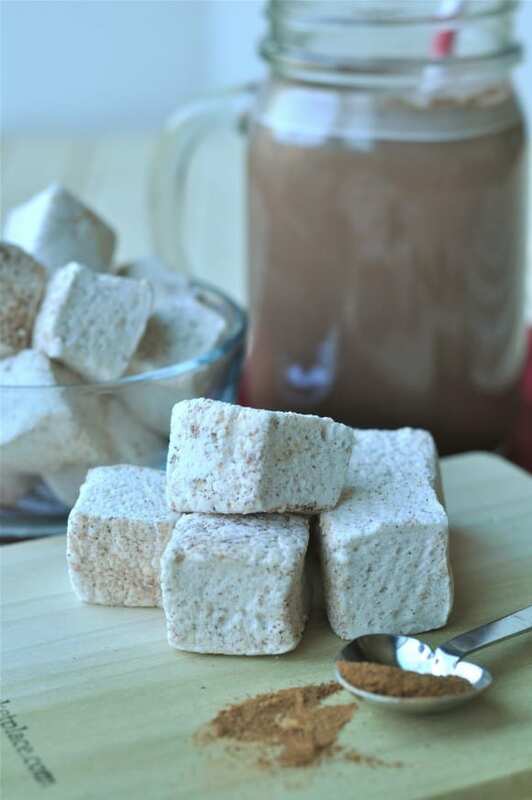 To cut your marshmallows, dust your working surface with the powder mixture and turn the marshmallows out of the pan. Use a pizza wheel or a sharp knife to cut squares. Once the square is cut, toss in the powder mixture. 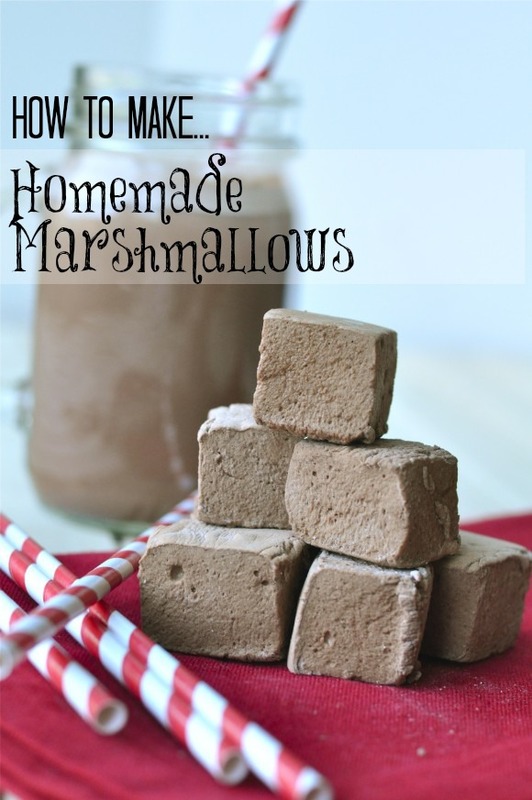 Makes: about 24 1-inch marshmallows. Once you have poured it all in, turn your mixture up to medium high. Continue to whisk until until the mixture thickens and is warm to the touch. Add the cinnamon during the last minute of whisking. Combine the cornstarch and powderd sugar in a small bowl. 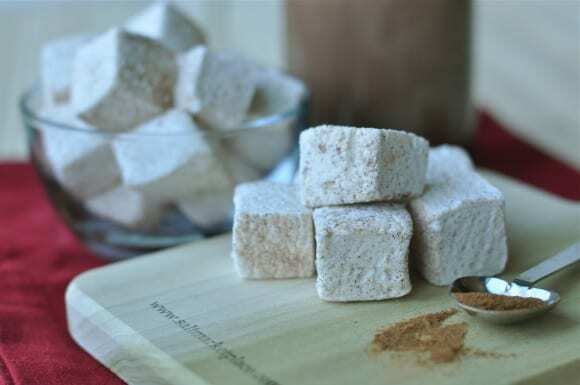 Pour the cinnamon marshmallow filling into the 9x13 and spread it evenly in the pan. Dust the top with the powder mixture. Leave uncovered at room temperature for 4-6 hours. Thank you, Mindy, they look scrumptious, I can't wait to try them! To learn more about Mindy's entertaining & dessert adventures check her out at Creative Juice and on Facebook. Makes about 24 1-inch marshmallows.